already surrounds a thinking man. In the past couple of decades, the web of technology has encircled the globe. Devices have become obsolete so blindingly fast, that coming to grips with the pace of development has become tougher with time. From around the time Futureshock of Alvin Toffler became popular in the 1970’s, several hundred books have been written, talks have been arranged, conferences organized under the theme of technology, especially about computing technology that has come to influence our lives so penetratingly. However, the glare of new technology has grown so strong that most descriptions restrict themselves to the past 50 years or so, as it is not worthwhile to describe or study an obsolete technology in full working detail. Even if the earlier history is mapped out, the corresponding conceptual development, particularly the philosophical development is not generally addressed. Additionally, innovation has been a goal much stressed upon in recent years. In a rapidly changing environment, it is doubly difficult to identify what is really new, making it a tricky goal to work with. Hence what is most needed is an analysis of the way we came to be where we are today in terms of technology, and a clear understanding of what the effect of technology is on the human mind. Only this can show where we are headed. These two aspects are addressed in this work: how this technology was created, and how it is related to the thinking process. Not only is a historical overview provided, but the conceptual developments that came into being along the way are highlighted as well. This is seen to lead right back into the time of the Renaissance and the Age of Enlightenment, and by suitably arranging the different streams of thought so that their effect on each other can be seen, a way is found into the much distant past − to the origin of the ideas guiding technology today. This path can get winding at times, but is by no means random. The aim of the process is to see if the way technology has developed was the only way possible, and if there are any ideas that can give a different orientation for it. At the same time, by studying the effect of machines on the human mind, ways to understand and compensate for these effects are suggested. It is hoped that this will help to not only tackle technology in the right way, but also enable new ideas to enter into this field, that can prove to be fruitful for every free thinking person. One of the distinguishing features of the world today is the sheer number of distractions one is subjected to day in and day out. Every aisle in the supermarket has a thousand options, every street in the city has a thousand boards and advertisements, and every click of the button pours out a million options for pursuit. The sights and sounds that blare forth from all directions, especially in the midst of a big city have reached unprecedented levels, especially if all the earphones and small-screens are included. This development is noticed not only by the experts in psychology or students of anthropology, but also by the general public. The sudden rise of computers, Internet, smartphones and its consequences can hardly be missed by anyone. This transition into the world of distraction is being experienced by a larger section of the population today than ever before, and quicker than ever before. As the things that demand our attention have proliferated, attention-spans appear to have gone the other way. In the span of just fifteen years, it can be observed that it is much harder to concentrate on one topic today, in any field of life than before. In order to accommodate, and to somehow work with this limitation, the fields of knowledge have gradually splintered into innumerable tiny boxes. Observe the number of specialists that have arisen in the various fields of knowledge e.g. “a doctor” is not to be found easily, but rather an “ologist”, whose specialty is one specific part of one specific organ of the body. It is hard for a scientific investigator to even understand the vocabulary of another field of science, let alone communicate the thoughts accurately. It is actually easier to be “the expert” of a small topic than to have an in-depth grasp of a wide array of knowledge. This appears to be one of the side-effects of the Information Age: a fracturing of knowledge and attention. So on one hand, the ability to access information has increased enormously, and on the other hand, the ability to remember, assimilate and work with that information is getting difficult. Noticing this change is one thing, coming to terms with it is quite another. It is clear that with time, these effects of technology can only increase. This brings up several questions. How did this technology arise? Where did it originate, and where is it headed? How can one distinguish between the harmful and useful effects of technology? Where is it possible to draw the line, if at all such a line exists? It is possible to think about technology in simple terms, for example: the knife that is in the hands of a surgeon and the knife that is in the hands of a robber. If so, then it is not the knife that is the issue at hand, but the person and his motives, in which case all worrying about technology becomes irrelevant. However, things are not as simple as that when comparing a knife with the effects of modern computing technology. The effects of a knife are clear and visible to all while the effect of technology on the workings of the innermost aspects of the mind is not easily visible. The cooperation with the machine remains out of sight. Studying the visible effects of technology is easier than understanding the invisible effects on something as internal as thinking and focusing. Computing technology is, as the saying goes, a whole other animal. It is therefore important to identify what the relationship is between thinking capacities and our current technology-filled life, and what can be done about it. This is a vast field, and it would involve delving into an obstacle course of sorts to trace the origin of the relevant ideas. Since these changes are not easily visible to the eye, it requires some patience to identify the path to be traced. Hence, a good approach would be to consider the changes themselves in greater detail, and try to get a clear image to work with. This way the right questions can reveal themselves along the way, instead of trying to force-fit the situation into specific questions. Since the topic is about the recent changes in thinking capacities, it is best to begin with the present day and work backwards, which will be done in the articles to follow in this series. For more than 2000 years a war is being waged for the control of India and the access routes connected to it. The Turkey Coup is the beginning of the end of the Great Game, as it is known. With Russia slipping out of their hands, the eyes were set on an unfathomably resource-rich country, which even after thousand years of non-stop plunder and looting still captures the imagination of one and all, thugs, thieves and robber-barons alike with her yet-unknown massive economic resources potential — that country is India. 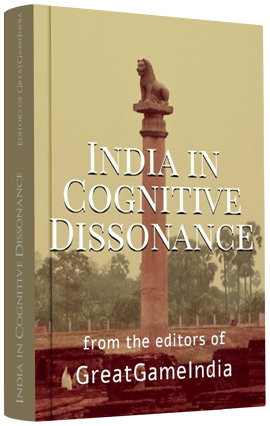 India in Cognitive Dissonance is a hard-hitting myth-buster from GreatGameIndia. A timely reminder for the decadent Indian society; a masterpiece on Geopolitics and International Relations from an Indian perspective – it lays bare the hypocrisy taken root in the Indian psyche because of the falsehoods that Indian society has come to accept as eternal truth. Huawei Controversy And Telecom Security In India | GreatGameIndia on Is India Under Weaponized Biological Attack?